To experience true summer atmosphere, visit Dubrovnik in the period from June to September. July and August are months with temperatures often rising over 30 °C and are excellent for those who enjoys sunbathing or swimming in crystal clear Adriatic sea. This period is ideal for island hopping to the nearby Elaphite islands or sailing beautiful coast. The temperatures in June and September are a bit lower. So, if you don't like big crowds and high temperatures, visit Dubrovnik in June or September. The autumn and winter temperatures range from 5°C to 15°C. However, even during the winter there are many days when the sun shines upon Dubrovnik and the sky is crystal clear. Visit Dubrovnik in the spring time when you can experience sunny weather and pleasant temperatures (15°C - 25°C). Spring time offers you opportunity to explore historic Old Town or make interesting trips to the countryside or nearby countries. In general, the weather in Dubrovnik is pretty mild. Dubrovnik has 250 sunny days annually. The average annual temperature is 17°C (winter 10°C, summer 26°C). The average sea temperature during summer time is 21°C. January is a good month to visit Dubrovnik if you want to escape cold temperatures typical for some European countries. Average temperatures in January range from 5°C to 11°C. Dubrovnik has an average rainfall of 139 mm during January. 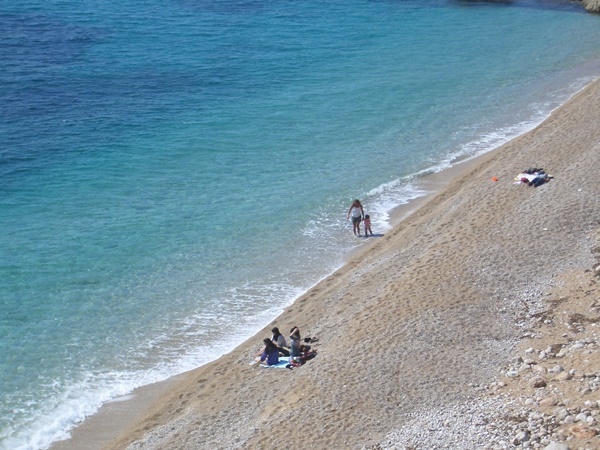 The average sea temperature is around 14°C, so swimming is not recommended. Dubrovnik has an average of 5 hours of sunshine a day in January. The month of February is slightly warmer that January, with average temperatures ranging from 5°C to 12°C. The average rainfall during February is 125mm, with 5 daily average sunshine hours. The average sea temperature is around 14°C (too cold for swimming). In March the weather in Dubrovnik is getting a little bit warmer. Average temperatures range from from 7°C to 14°C. The average rainfall is also lower than that of January and February - 104mm. Dubrovnik has an average of 5 hours of sunshine a day in March. The average sea temperature is still around 14°C. Average temperatures in April range from 10°C to 17°C. Dubrovnik has an average rainfall of 104 mm during this month. The average sea temperature is around 15°C. Dubrovnik has an average of 6 hours of sunshine a day in April. May is one of the most beautiful months to visit Dubrovnik. It's before the big tourist crowds yet the weather is warm and sunny enough to enjoy the city. Average temperatures range from 14°C to 21°C, with an average of 8 sunshine hours per day. The average rainfall during May is around 75mm and the average sea temperature is 18°C. The weather makes June an excellent month to enjoy Dubrovnik and the rest of Croatian coast. Average temperatures range from around 17°C to 25°C with an average of 10 hours of sunshine per day. The average rainfall during this month is only 75mm, so you are very likely to experience dry weather during your stay in Dubrovnik. In June the sea temperatures are warm enough to make swimming a real pleasure (around 21°C). July in Dubrovnik provides the perfect sunbathing weather with the long sunny days (the average sea temperature is 24°). Average daily temperatures range from around 20°C to 28°C with an average of 13 hours of sunshine per day. Average rainfall during July is just 26mm. August in Dubrovnik is ideal for beach activities such as snorkelling, water-skiing, sea-kayaking and wind-surfing. Average temperatures range from around 20°C to 28°C with an average of 11 hours of sunshine per day. The average rainfall during August is around 38mm and the average sea temperature is 25°C. September in perfect time for visiting Dubrovnik. It is not as crowded as during summer months and the weather is still warm and sunny. Average temperatures range from around 17°C to 25°C with an average of 9 hours of sunshine per day. The average rainfall is around 101mm and the average sea temperature is 23°C. October in Dubrovnik is still fairly warm but the temperatures are lower than during summer months. This is ideal time for those who like outdoor activities like walking, biking or sailing. Average daily temperatures range from around 13°C to 21°C with an average of 8 hours of sunshine per day. The average rainfall is around 162mm and the average sea temperature is 21°C. November is the rainiest month of the year in Dubrovnik (average rainfall is around 198mm). This month is ideal for exploring cultural and gastronomic offer of Dubrovnik. Average temperatures range from around 9°C to 16°C with an average of 6 hours of sunshine per day. The average sea temperature is 18°C. For anyone looking for a relaxed New Year's Eve the city of Dubrovnik would be a great choice. Average temperatures range from around 6°C to 13°C with an average of 3 hours of sunshine per day. The average sea temperature is 15°C. Average rainfall during December is around 178mm.